After a tough, dark winter, the arrival of summer sends Scandinavians off to vacation homes and cabins to enjoy longer days surrounded by nature. Thanks to their love of minimalist design and respect for their surroundings, Scandinavians have created some incredible getaways in beautiful bucolic settings. Take a look below for a roundup of 10 of our favorites, some of which have been shared by the community through Add a Home. 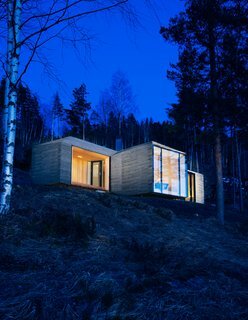 The exterior walls and roof of this 538-square-foot seasonal, eco-friendly retreat are clad in overlapping stone plates that mimic the look of traditional wood panelling found in Western Norway. 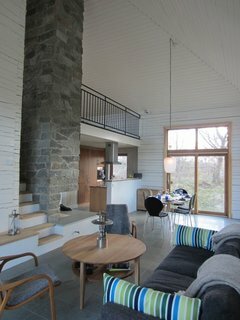 Overlooking Lake Steinsfjorden, it's filled with LED lighting inside and has a chimney pipe that's lined with solar panels. 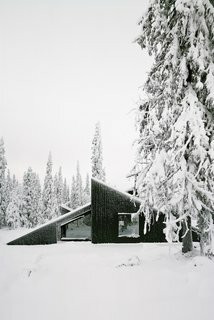 "It provides an affinity with the cabins nearby," partner and architect Nils Ole Bae Brandtzæg explains. Architect Irene Sævik’s summer retreat is located an hour from Oslo. 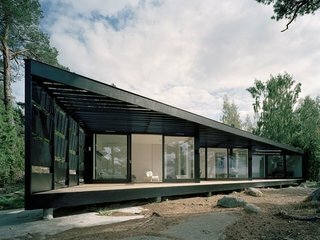 Originally built in the 1960s by the Norwegian artist Irma Salo Jæger, the 430-square-foot cabin was in partial disrepair for years before Sævik purchased it and decided to expand. Scandinavian minimalism and respect for nature have influenced the home's design. The pavilion concept of this cabin is emphasized by its large roof, which also serves as a shelter for rainy days. 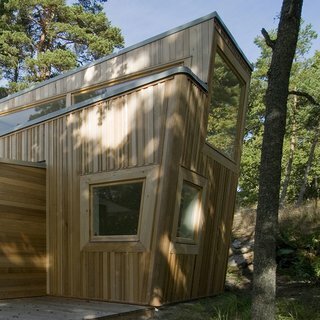 The concept of this Scandinavian getaway was simple: to create a cabin that's small and sparse, yet spatially rich. The 592-square-foot cabin, commissioned by a private client and completed in 2016, comprises a large living room, bedroom, ski room, and small annex with a utility room. It functions off the water and electricity grids. 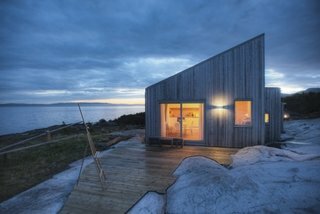 Designed by TYIN tegnestue Architects and built by the owners themselves, this cottage celebrates traditional back-to-nature elements in traditional Norwegian culture. 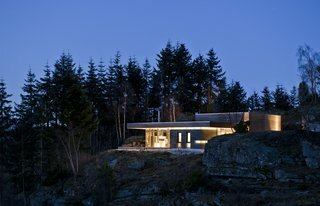 Situated amidst marshland, sea-adjacent rock, and scattered pine-and-juniper vegetation, careful consideration was made to protect the sensitive surrounding terrain. Only 328 feet from the sea, some marsh had to be cleared while preparing for the construction, exposing bedrock—which integrated the cottage into the landscape. 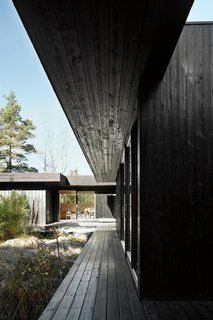 Nestled into a clearing in a forest of tall pines in the Stockholm archipelago, the exterior of this island home is clad entirely in folded black sheet metal. Three glazed sliding doors with hardwood frames provide entrances and direct access to the outdoor areas. Built entirely of wood, this cabin in the forest of Ingarö was constructed in close collaboration with local builders and local woodworking companies—and was inspired by its sylvan setting. 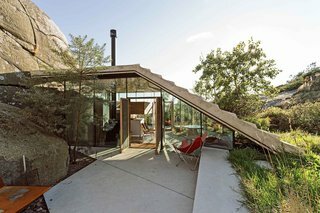 Nestled between large rocks and the low vegetation of the Sandefjord coast in Norway, Cabin Knapphullet is a small cabin inspired by its location. At only 323 square feet, it contains an open living space with a bathroom and a mezzanine bed that sleeps two people. Although the building occupies a small footprint, the space expands vertically over four levels, including a roof terrace. This small vacation home in Sweden’s southernmost province is actually a cabin that has logs covered by blackened vertical board cladding. The living roof has been planted with sedum—a homage to the area's traditional sod roofs.